Scanning requirements across the globe are becoming more complex as the need for information increases. Scanners are required to read much more than just 1D bar codes. The good news is scanning and imaging technologies are evolving as well. Manufacturing and Warehousing are among the most demanding environments for bar code scanning. Durability and reliability are of the utmost importance, as well as the ability to scan bar codes from distances of a few inches to 50 feet or more. The goods news is . . . we've got you covered! Honeywell - The Granit™ 1980i (tethered) and Granit™ 1981i (wireless) industrial scanners feature full-range area-imaging technology and are capable of reading both 1D and 2D bar codes from 6 inches (15 cm) to over 50 feet (15 meters). From poor quality 7.5 mil paper codes scanned at arm's length to 100 mil retro-reflective codes hanging from warehouse rafters, this scanner is built to read virtually all bar codes supporting maximum operator productivity in the harshest environments. Looking for an industrial scanner? Zebra has you covered with the new Ultra Rugged 3600 Scanner! Built to withstand the demands of the manufacturing floor and distribution center, the new 3600 redefines the standard for rugged design, scanning performance and manageability. Scanning Distances Up to 70 Feet? Not a Problem with the DS36X8-ER from Zebra! Zebra DS3608-ER / DS3678-ER - Give your workers unstoppable performance in the toughest environments with the corded DS3608-ER and cordless DS3678-ER ultra-rugged 1D/2D handheld scanners. Your workers get lightning fast capture of any 1D or 2D barcode displayed on a screen or printed on a label in virtually any condition, nearer and father than any scanner in this class — from 3 in./7.6 m to as far as 70 ft./21.4 m. away, a design that is practically indestructible and freezer-ready, plus unrivaled manageability that makes staging and everyday management easier than ever. Take a Closer Look at the 3600 Scanner Series! LI3608 / LI3678 - Give your workers unstoppable performance in the toughest environments with the corded LI3608 and cordless LI3678 ultra-rugged 1D handheld scanners. Your workers get lightning fast capture of any 1D bar code in virtually any condition, a design that is practically indestructible, plus unrivaled manageability that makes staging and everyday management easier than ever. DS3608-SR / DS3678-SR - Give your workers unstoppable performance in the toughest environments with the corded DS3608-SR and cordless DS3678-SR ultra-rugged 1D/2D handheld scanners. Your workers get lightning fast capture of any 1D or 2D bar code in virtually any condition up to 5 ft./1.5 m away, a multi-code feature that can capture up to 20 bar codes on one label simultaneously, a design that is practically indestructible, plus unrivaled manageability that makes staging and everyday management easier than ever. DS3608-HP / DS3678-HP - Give your workers unstoppable performance in the toughest environments with the corded DS3608-HP and cordless DS3678-HP ultra-rugged 1D/2D handheld scanners. You get superior capture of bar codes and more, with lightning fast capture of any 1D or 2D bar code in virtually any condition up to 7 ft./2.1 m away — plus OCR, photos and documents; a multi-code feature that can capture up to 20 bar codes on one label simultaneously; a design that is practically indestructible; plus unrivaled manageability that makes staging and everyday management easier than ever. DS3608-HD / DS3678-HD - Give your workers unstoppable performance in the toughest environments with the corded DS3608-HD and cordless DS3678-HD ultra-rugged 1D/2D handheld scanners. You get lightning fast capture of the small and dense 1D and 2D bar codes common in electronics and medical equipment manufacturing as well as standard printed bar codes in virtually any condition; a multi-code feature that can capture up to 20 bar codes on one label simultaneously; a design that is practically indestructible; plus unrivaled manageability that makes staging and everyday management easier than ever. DS3608-DP / DS3678-DP - Give your workers unstoppable performance in the toughest environments with the corded DS3608-DP and cordless DS3678-DP ultra-rugged 1D/2D handheld scanners. You get lightning fast capture of direct part marks on any surface, as well as standard printed bar codes in virtually any condition; a design that is practically indestructible; plus unrivaled manageability that makes staging and everyday management easier than ever. Zebra - With the LS3408-ER, workers are able to read labels from as far away as 45 feet and as close as 4 inches—the greatest working range available in a rugged, handheld scanner. Designed to withstand harsh conditions and scan-intensive applications, the LS3408-ER has the ergonomics workers appreciate during long shifts. Zebra - Industrial environments, warehouses and manufacturing facilities aren’t friendly to bar code labels. Damaged, dirty or poorly printed bar codes are typical, slowing down the data capture process. The rugged LS3408-FZ handheld corded scanner features fuzzy logic technology for fast and accurate reading of1D bar codes, no matter what their condition. Honeywell - The SR61 series of rugged scanners are built to perform in the most demanding environments. The Intermec SR61 handheld scanner family is built for rugged applications in warehouse, distribution and industrial manufacturing, and also supports proof of delivery and point of service applications. Available with numerous scanning options, the SR61 covers all your scanning needs. The SR61 1D scanner can be tailored to your environment—whether this includes reading specific bar code symbologies or decoding poor quality or damaged symbols. Tested to exceed industrial and military specifications, you can rely on SR61 in the most demanding environments. SR61 HD/DPM - Reliably scan high density bar codes and direct part marks applied with a variety of manufacturing processes: dot peening, chemical etching, laser etching, casting, engraving or stenciling—while still providing snappy performance on standard bar codes. SR61 HP - Presenting the pinnacle of imaging for 2D bar codes: our fastest scanning engine in our most robust form factor. Incredible motion tolerance and omni-directional scanning make SR61HP the most responsive scanner in its class. SR61 XR - The world's first handheld scanner with integrated near/far area imaging technology, offering the unparalleled flexibility to read multiple symbologies, omni-directionally, at distances from six inches to over 50 feet away. Scanners in this category can be used in a variety of applications that can that can be very demanding as well and scanners are built to be durable and reliable. Wireless Scanning that Doesn't Require a Battery! Honeywell - The Voyager™ 1202g-bf single-line laser scanner incorporates breakthrough battery-free technology, offering the freedom of Bluetooth® wireless technology without the maintenance hassle, long recharge time, or environmental disposal issues associated with traditional batteries. The 1202g-bf delivers aggressive linear bar code scanning performance—even on poor quality or damaged bar codes. Zebra - From the retail POS to shipping/receiving and hotel check-in, the LI2208 allows your workers to better meet the needs of your business. The next generation in 1-D scanning, the LI2208 provides the same reliability and ergonomics of the LS2208, with enhanced features that let you scan more types of barcodes at a greater distance. Honeywell - The Voyager 1450g allows enterprises to embrace area-imaging at their own pace, and in the most cost-effective manner. The Voyager 1450g delivers omnidirectional reading of linear bar codes, plus the ability to affordably upgrade the device to enable PDF and 2D bar code scanning—either at the time of purchase, or as data capture needs evolve. 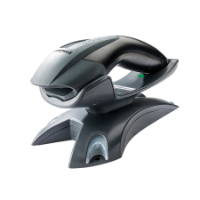 Honeywell - The SG20 is an affordable, performance handheld scanner suited to the demands of countertop scanning in retail point-of-sale, office, library, and light manufacturing. Available in tethered (corded) or Bluetooth® wireless, with your choice of 1D or 2D imager. This scanner category has some unique challenges. Anti-microbial or chemical resistant housings are generally used on devices used in healthcare. Honeywell - With industry-leading performance and reliability, the Xenon 1902h area imager is well suited for a wide variety of healthcare applications that require the versatility of area-imaging technology plus the freedom of Bluetooth® wireless connectivity. The Xenon 1900h, tethered version is also available. Honeywell - Important hospital verification processes don't need to impact productivity. With the SG20 HC, scanner, time and effort to read bar codes is minimized with the fastest 2D healthcare scanner on the market. Designed with ergonomics and the hospital environment in mind, the SG20 healthcare scanner features a housing made of disinfectant-ready materials. Honeywell - The 8600 Series of wearable ring scanners are built for durability. Including both a 2D imager and a standard range laser scanner, this low profile wearable scanner reduces interference and improves user transaction time allowing for mobility and efficiency. The 8600 wearable scanners allow operators to quickly switch between the right and left hand. The most advanced and most rugged Bluetooth 1D/2D ring scanner is here — the Zebra RS6000. The RS6000 outshines its competition with the ability to scan faster and nearly four times farther, and offers up to five times the battery power. Users can simply tap to pair— no more scanning barcodes, manually configuring devices or accidental pairing with a nearby device. With Wi-Fi Friendly Mode, this Bluetooth device won’t cause interference on your WLAN — guaranteed. When it comes to ease of use, the ambidextrous trigger button and mounts allow users to instantly switch between right and left hand operation on-the-fly. And flexible manual or automatic triggering allows you to give your workers the right mode for the task at hand. Maximize the value of your workforce and your Zebra mobile devices with the RS6000. Honeywell also offers the option of pairing the 8600 ring scanner with a wearable accessory for the Dolphin 75e or Dolphin 70e Black which essentially converts it to a wearable computer. Honeywell - The Captuvo Series Sleds transform Apple® devices into powerful enterprise solutions. Each model offers aggressive scan performance using Adaptus™ Imaging Technology, an encryption-ready magnetic stripe reader (MSR), and an additional layer of protection, which increases productivity, facilitates secure payment processing, and maximizes end user uptime. Captuvo enables employees to more easily engage with customers or care for patients in a healthcare setting. Captuvo SL62 - Enterprise sled encases the popular Apple® iPad mini™, transforming it into an enterprise-ready device for businesses that prefer the simplicity and familiarity of iOS, but need additional functionality built in like scanning and secure payment processing. Captuvo SL42 - The SL42 targets mobile frontline workers who require real-time connectivity to business-critical applications and superior barcode scanning performance to improve productivity and better serve customers whether in the office, on the road, or in the field. For enterprises looking to extend the capabilities of the Apple® iPhones® , the SL42 transforms the popular smartphone into an enterprise-ready solution that speeds business agility and lowers total cost of ownership.